You are at:Home»BUZZ»BLINK – The high tech bike seat! Biking has been a large part of my life the past couple of years. Last year I logged in a couple of thousand miles on my bike, when I trained and participated in the AIDS LifeCycle 545 mile bike ride from San Francisco to Los Angeles. Fortunately for me, my only accidents involved me doing something stupid, like sneezing. 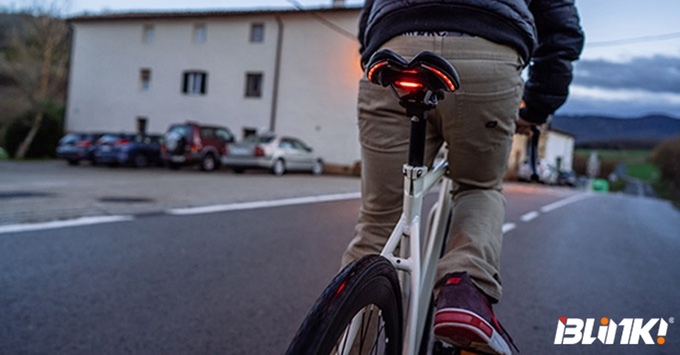 If you ride often or ride in a congested area, you should check out BLINK – this bike seat has bright LED lights, which not only has remote turn signals, but also a cool feature which makes the break light brighter when you are breaking. There are three different models of the device depending on your cycling preference: e-series, se-series, and x-series. Other features of BLINK include: 270 degree visibility, weather proof and it is usb rechargeable. BLINK is expected to ship in November of this year and super early bird of 75 Euros is currently available for those of you itching to try some new bike tech. NOTE: Shipping outside of Spain is quite expensive at 15 Euros. What do you think is $100 for a high tech bike seat too much? Remix IO – a souped up Chromecast! iLDOCK – Solving iPhone 7 (Plus) Audio Jack Problem!